I never intended to be away from this blog for so long (family commitments) but here we are, many months since my last post. As my mum used to say, ‘better late than never’! During my absence something wonderful happened that I just have to share with you. Jenny from Lincolnshire contacted me regarding photographs of the Arrighi family, which I posted prior to my inpromptu break. Jenny had instantly recognised them because she is the grand-daughter of James Arrighi. In fact, it is Jenny’s own hand-writing on the back of some of the photographs. They were in her possession until a few years ago when she moved house and were somehow mislaid. It is a mystery how they ended up in the batch of images I purchased last year, but as you can expect, she was very happy to see them again. Jenny and I met shortly after our initial contact and I was able to reunite her with the family photos, which was a privilege and a thrill for me because it is, after all, the reason I keep this blog. I briefly searched for Mrs Denton but suspect her name isn’t ‘Mawby’ (the best I can decipher from her writing). Any thoughts? Thank you Jenny, for sharing this information. It was a real pleasure to meet you and reunite you with your photographs! It seems appropriate on this sunny Sunday, to share this set of six photographs of friends having fun in Blackpool. I love their cloche hats and delightful expressions. I imagine them strolling along the sea-side promenade, stopping for ice-cream or candy floss, perhaps giggling as a young man or two nods a wink at them, and then capturing the happy moment in a photo booth. According to the following advertisement, Blackpool had several photo booths (or Photomatons) to choose from in the late 1920s. Still a relatively new experience, it must have felt exciting and novel to record the memories in this way. After all, there were no selfies in those days! Newspaper clipping courtesy of the British Newspaper Archive; The British Library Board. 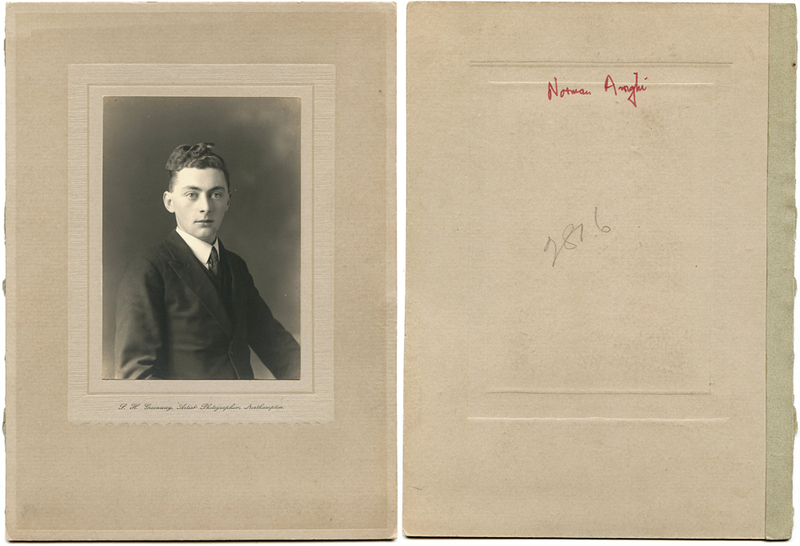 Staying with the Arrighi family, these portraits and photographs are all labelled. I won’t say too much about them, but would love to receive contact from anyone who is interested, recognises or is related to this family! Some of the images are clickable, for larger versions. 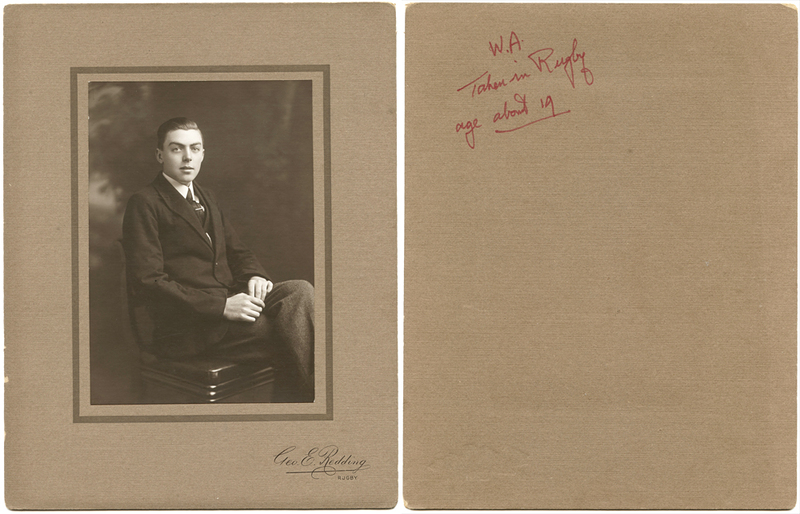 Middle son of James Arrighi (see previous post), the inscription on the back of this portrait says WA – Taken in Rugby – age about 19. He is easily recognisable from the family photograph, which must have been taken around the same time. 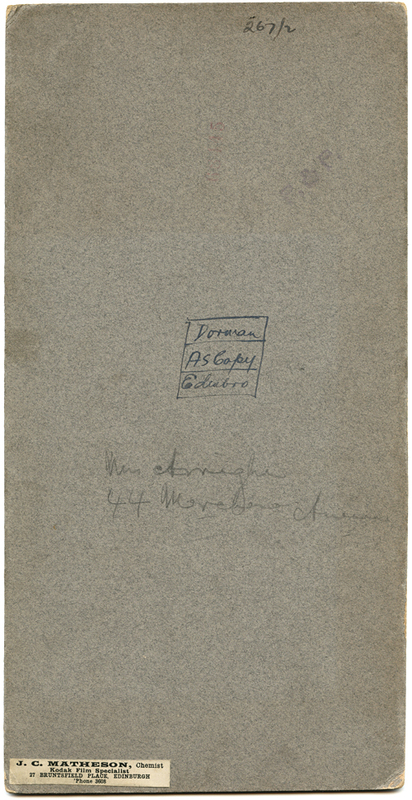 The eldest of the three sons of James Arrighi, the inscription on the back simply says Norman Arrighi. It was taken by S H Greenway of Northampton and, like his brother above, Norman is easily recognisable from the family photograph in my previous post. Another portrait (below) shows Norman at a slightly older age. Copied from a photograph, this print is mounted on a large board and bears a sticker for J. C. Matheson, Chemist, 27 Bruntsfield Place, Edinburgh. The pencilled writing is difficult to read, but having searched the newspaper archives my best guess would be Mr Arrighi – 44 Merchiston Avenue. The address was first occupied by Louis John Arrighi b.1863 (brother of James Arrighi) and later by his son, Frederick Wilson Brown Arrighi b.1906. I think it likely that Mr Arrighi is in fact Fred(erick), who can be found at Merchiston Avenue in the British Telephone Directories during the late 1920s and 1930s. I think he bears more than a passing resemblance to his cousins above, don’t you? Information was gathered from the British Newspaper Archive, Ancestry and Scotland’s People. 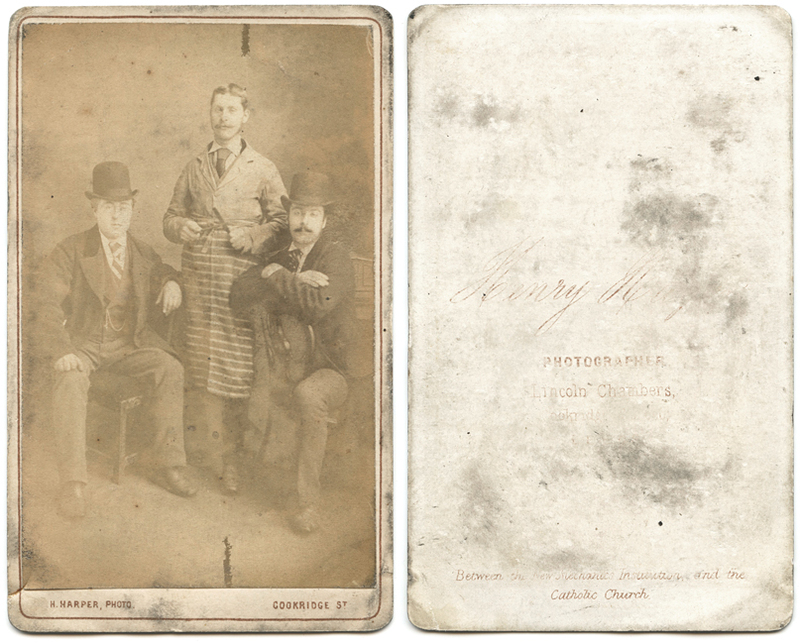 Two separate photographs of the Arrighi family, from the same bundle but mounted on different card. The upper image was presumably in a large presentation folder, but the protective cover has been removed. It was taken by John Mills, 10 St. Giles Street, Northampton and has a lovely sepia tone. The lower image is mounted on stiff card and trimmed to the size of the actual photograph. It is black and white and shows quite a lot of wear. I prefer the sepia tone, which renders the details more finely. You might recognise the man on the right of the photograph from my previous blog post. It is James Arrighi, looking a little older but still as smartly dressed. His handsome family consists of his wife, Agnes Reid Hunter, and their four children. 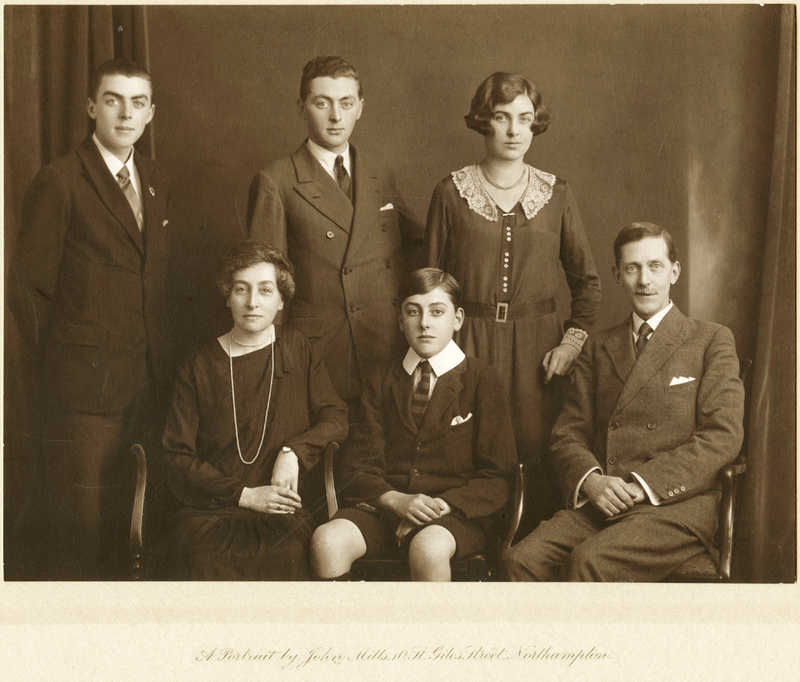 Louis Alfred Arrighi, the youngest child, is sitting between his parents. He was born in 1914, which dates the photograph to the late 1920s. Standing at the back from left to right are William Hunter Arrighi b.1910, James Norman Louis Arrighi b.1908 and Amelia Compton Arrighi b.1905. Sadly the youngest child, Louis, was killed during WWII at the age of 26. He was initially reported as missing (1) but later found to have died. He is buried in the Netherlands. It must have been a terrible time for the family, not knowing what had become of him. In July of 1941 a memorial was held for Louis at the Congregational Church in Yardley Hastings, Northamptonshire (2). Hopefully the family were able to take some comfort from this. I have yet more portraits to share, this time of the two older boys. Please check out my next blog post. Newspaper clippings courtesy of the British Newspaper Archive; The British Library Board. Further research carried out using Ancestry and Find A Grave. On the back of this portrait is written ‘James Arrighi 1877-1960’ and he was the youngest son of Louis Arrighi (see previous post). The portrait was taken by S. H. Greenway Studios, Northampton and Daventry, and probably dates to the late 1900s when James was around thirty years old. His beard and moustache resemble that worn by King George V and give him a very regal look! Researching James’ family, I was intrigued by his daughter’s middle name, Amelia Compton Arrighi, who was born in 1905. She was presumably named after the Compton family who reside at Castle Ashby and have done so since the 1500s. 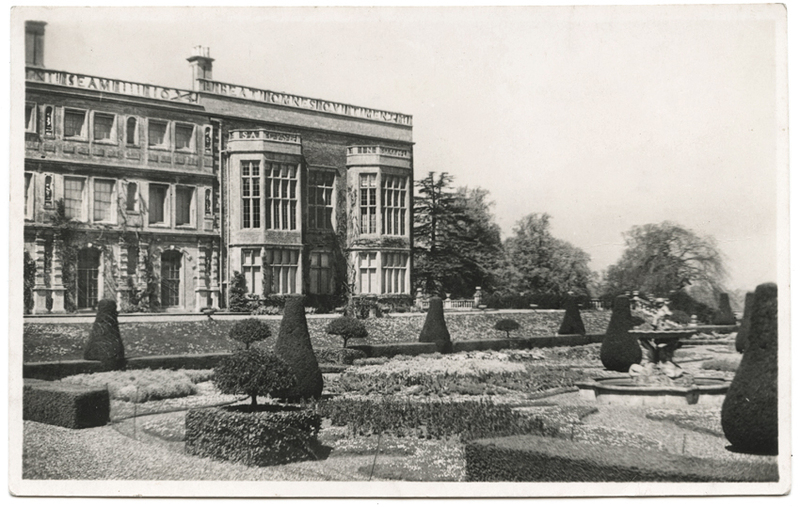 I also found the following postcard of Castle Ashby House among the photographs. A souvenir of the Arrighi family’s time there, perhaps? James Arrighi passed away in 1960 at the age of eighty-four. I have more photographs relating to his family that I plan to share, but will save them for future blog posts. Newspaper clippings/information courtesy of the British Newspaper Archive; The British Library Board. Further research carried out using Ancestry and Scotland’s People. This is probably one of my favourite portraits and, like the previous portrait of Louis Arrighi, was taken by the studio of Scottish photographer John Campbell Harper. From the fashion of the day (the dress and hairstyle) I would estimate the date as mid-1910s. The ‘Campbell Harper’ studio started life in Leith Walk around 1908, so this date would be consistent. 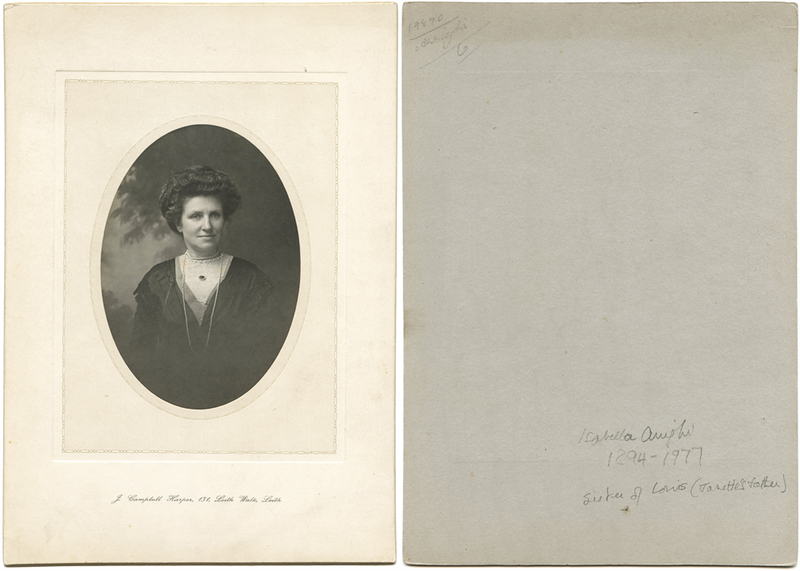 The inscription on the back of the photograph identifies the sitter as Isabella Arrighi, born 1894 and therefore around 20 to 25 years old. Hmm. With no disrespect, I suspect the lady in the portrait was older than this. So is the inscription wrong? A little research shows there were several Isabellas in the Arrighi family. The Isabella Arrighi identified by the inscription was grand-daughter of Louis Arrighi and daughter of Louis’ eldest son, Louis John Arrighi (b.1863). But in my view, she can be discounted on the basis of being too young. Louis Arrighi’s wife was also called Isabella. Born in 1841, she died in 1910 prior to the likely date of this photograph. So she can also be discounted. Another Isabella Arrighi was daughter of Louis’ older brother, Leopoldo Arrighi. She was born around 1862 in Edinburgh, although a precise age is difficult to obtain due to her shaving a few years off as the decades went on! She died in 1939 and would have been in her fifties during the 1910s. Lastly, Louis’ own daughter was called Isabella Richardson Arrighi. She was born in 1869 and died (unmarried) in 1929, being buried with her parents at Comely Bank Cemetery, Edinburgh. During the 1910s she would have been in her forties and in my opinion is the most likely candidate for this portrait, not only because of her age, but also because I found the portrait alongside that of Louis Arrighi (see previous blog post). There could of course be other Isabella Arrighis’ I have yet to come across. This all begs the question as to why the inscription is incorrect? And also acts as a warning against taking any named photograph at face value. A small amount of research can go a long way, although it can also muddy the waters! Names and dates were obtained from Ancestry.co.uk and Scotlands People, but should only be used as guidance. 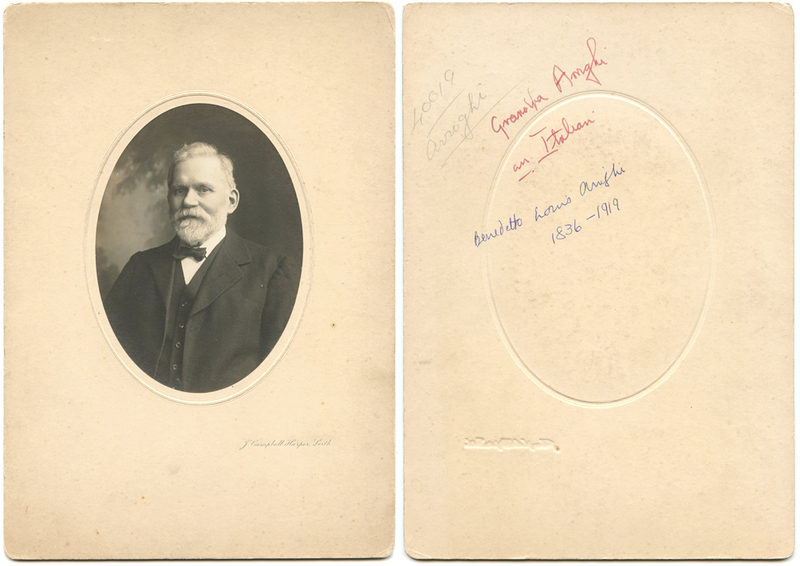 This portrait is identified on the back as ‘Grandpa Arrighi an Italian / Benedetto Louis Arrighi 1836-1919‘ in two different pens and styles of handwriting. It is signed by J. Campbell Harper of Leith (near Edinburgh, Scotland). Louis Arrighi married Isabella Richardson in 1859 in Edinburgh, where they lived throughout their married life. Both Louis and Isabella are buried at Comely Bank Cemetery. Searching the newspaper archives I came across an article in the Dundee Courier (Tuesday 16 December 1952) which mentions ‘Louis Arrighi, the young Italian who arrived in Scotland to seek his fortune‘. The article goes on to say that ‘he undertook work on the Wallace Monument at Causewayhead, Stirling, and the Wallace Statue, Aberdeen‘. Unfortunately I haven’t been able to confirm this claim, although the censuses do list his occupation as ornamental plasterer and, later, sculptor. I have more Arrighi family portraits to share, and hope to discover more about Louis as I go along! 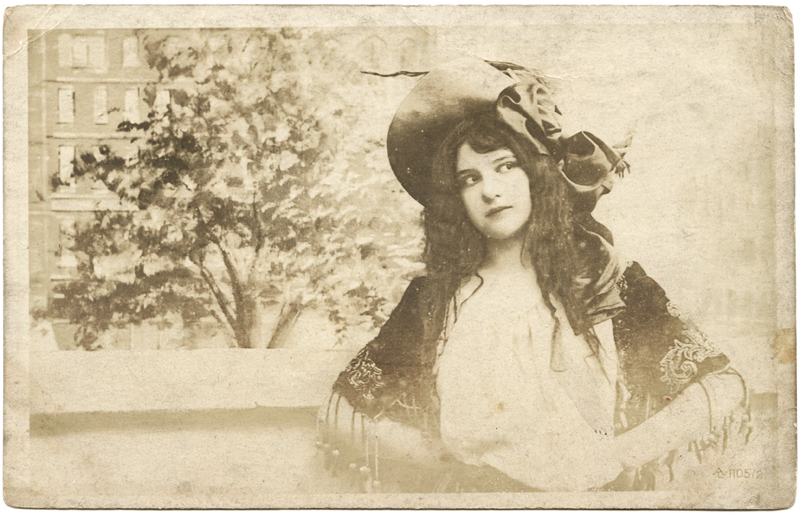 I snapped this postcard up as soon as I saw it, loving the bohemian styling and (in particular) the hat. Close inspection shows that it is one the A.L. 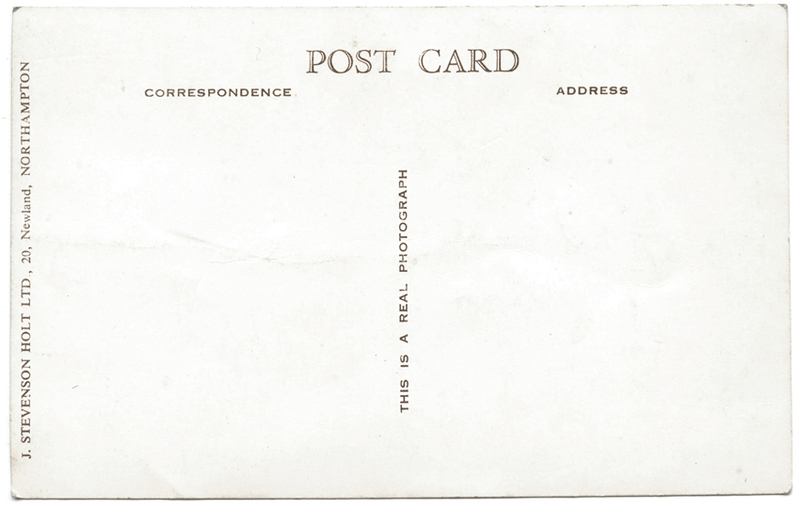 series of postcards from Aristophoto Co. (scroll down for details) who were in business from 1902 to 1910. I haven’t identified Miss Daniels, but think she may have been a servant at the above address. Her friend sounds concerned, so I hope Gertrude sent news of her whereabouts without too much of a delay. Neither have I been able to identify the woman in the photograph. 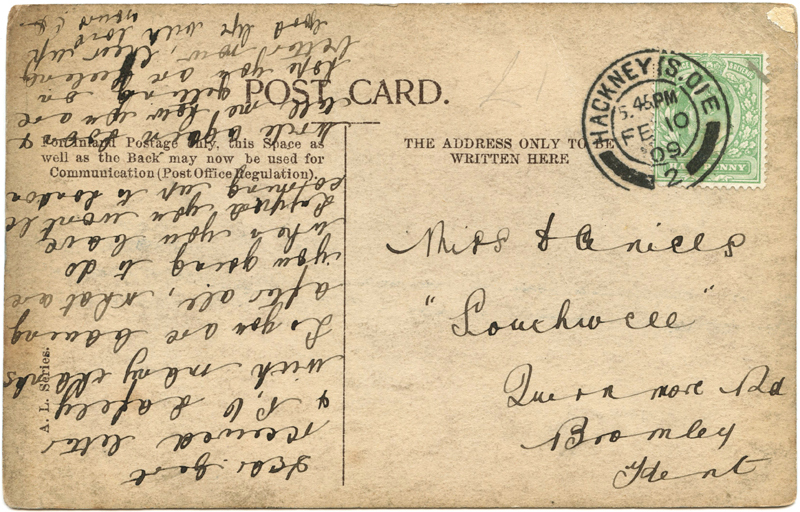 The postcard has the serial number 1105/2, but no name. Who is she? Answers on a postcard, please! This photo is small but packs a huge amount of charm. Trimmed down from a postcard, it is possibly a school photograph. I just love the little girl’s relaxed smile, the ribbon in her hair and her gorgeous twinkly eyes. Turning it over reveals information about the sender and receiver, written in pencil by Mary herself. The fairytale names (Myttons, Littlefair, Dumsup) made me wonder, at first, if they came from the child’s imagination. But no! They are real and exist, and I can’t tell you how happy that makes me. Mrs Littlefair can be easily found on the 1911 census, living at Dunsop Farm, Slaidburn, Lancashire. Born in 1849, her full name was Isabella Mary Littlefair (nee Furness). She was the second wife of James Littlefair who, at 21 years her senior, was 83 years old and had retired from farming. According to the census, Dunsop Farm was in the hands of Mr Littlefair’s younger son, also called James. So who is the fresh faced girl in the photograph? Initially I searched for the name Mary Myttons but that yielded no results. I had wrongly supposed that the word Wooff was an after thought but learned a valuable lesson… never make assumptions! Read differently, it became apparent that Wooff was Mary’s surname, and Myttons was a farm just a short distance from the Littlefair’s home. They were neighbours! Returning to the census, in 1911 John Robert Wooff, wife Ellen Wooff (nee Alston) and their four children were living at Myttons, Slaidburn. Mary was born later the same year and became the youngest of five. I would guess that she was around 9 or 10 years old in this photograph, making Mrs Littlefair around 70 and presumably an old lady to Mary’s young eyes. Mary died in 1976, aged 64, but left us this lovely momento from her childhood. I am sure Mrs Littlefair treasured it! Newspaper clipping courtesy of the British Newspaper Archive; The British Library Board. Further research carried out using Ancestry and Lancashire BMD. This worn and faded carte-de-visite dates to the 1870s. 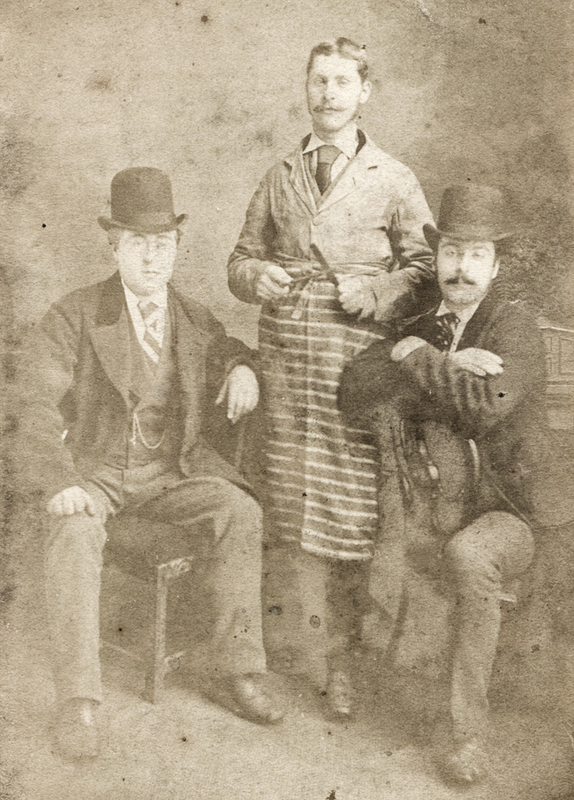 Two well-dressed gents wearing bowler hats sit either side of a young man sharpening knives. I assume he was a butcher, otherwise the scene might be a rather sinister one! The photographer’s name was Henry Harper, of Lincoln Chambers, Cookridge Street, Leeds. In 1871 Henry was living with wife Emma and daughter Florence on Hanover Street, and gave his occupation as photographer. His photographic career seems to have been a short one however, beginning around 1870 and ending in bankruptcy in 1876 (1). Sadly this second career was also short-lived, because Henry died (aged 35) on 2nd January 1881. According to the death notice, his younger brother died the very same day. I haven’t yet discovered any details linking the two deaths. Is it possible the brothers were together on that day, perhaps in Manchester? Or was it just a terrible and tragic coincidence? If I find any clues, I’ll add them to this post. Newspaper clippings courtesy of the British Newspaper Archive; The British Library Board. Further research carried out using Ancestry and The Gazette. Val on Arrighi Photos Reunited! loobiloo5 on Arrighi Photos Reunited!